Signed photo of Jimmy Magill the Arsenal footballer. 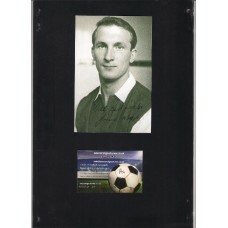 Home » Signed pictures » Signed photo of Jimmy Magill the Arsenal footballer. Jimmy Magill. This is a nice postcard size black and white reproduction photo of Jimmy Magill the Arsenal footballer. This photo has been hand signed in black ink for me by Magill. McGill joined Asenal in July 1965. He made his debut against Leeds United on 5 May 1966 (a match which coincidentally saw Arsenal's lowest-ever attendance at Highbury, of just 4,554) but could not break into the first team and left Arsenal in September 1967. He moved to Huddersfield Town, where he spent four seasons, and then another five seasons at Hull City. He finished his career at Halifax Town. Jimmy Magill only played 12 games for the Gunners between 1965 and 1967 so a signed photo of him the Arsenal kit is quite rare. £6.00.